Can the Bombers break their 14-year finals drought next season? AT ESSENDON, it will be a case of the long and the short of it in 2019. When the Bombers claim former Fremantle ruckman Zac Clarke in the pre-season supplemental selection period (SSP), which opens on Saturday, they will enter next season with 22 players 190cm or taller on their list, the equal-highest tally in the competition alongside Collingwood. The addition of Clarke, 203cm, will also give them five players 200cm or taller, just one short of the League high of six held jointly by the Blues, Brisbane, Port Adelaide and St Kilda. But if Essendon is well-placed to rule the air next season, it also has an arsenal of smalls itching to prey on any crumbs left by its giants. The Bombers boast eight players who stand 179cm or shorter, equal first in the AFL alongside Fremantle. By comparison, reigning premier West Coast, Sydney and North Melbourne will each enter next season with just two players shorter than 180cm on their lists. The newest member of the Bombers' small fleet is the aptly named Irving Mosquito, the 176cm goalsneak who was part of Hawthorn's Next Generation Academy but landed at Tullamarine after the Hawks declined to match the Bombers' bid of pick No.38 in the NAB AFL Draft. The Dons' magic bag of small forwards was already well stocked with Orazio Fantasia (177cm) and Anthony McDonald-Tipungwuti (171cm) but it's overflowing now that Mosquito is wearing the red and black. The looming acquisition of Clarke will also give Essendon a back-up ruck option for Tom Bellchambers in the wake of Matthew Leuenberger's unexpected retirement. But where the Bombers' big-man stocks are concerned it's the virtual acquisition of Joe Daniher that has some pundits bullish about their top-four chances in 2019. Daniher was sidelined after round seven last year with osteitis pubis and is not expected to resume full training until after Christmas. But if the Bombers can get the 2017 All Australian fit and firing their attack will have the focal point it lacked for most of 2018 – Mitch Brown was the leading goalscorer among the Bombers' key forwards last year with 18, way down on the career-high 65 Daniher kicked in 2017. However, the biggest question mark hovering over Essendon's legitimacy as a contender remains its midfield. Winning the four-club race for Dylan Shiel during the NAB Trade Period will make a big difference. But at 182cm, the former GWS star is not the inside beast – think Patrick Cripps, Nat Fyfe or Dustin Martin – the Dons have been crying out for. 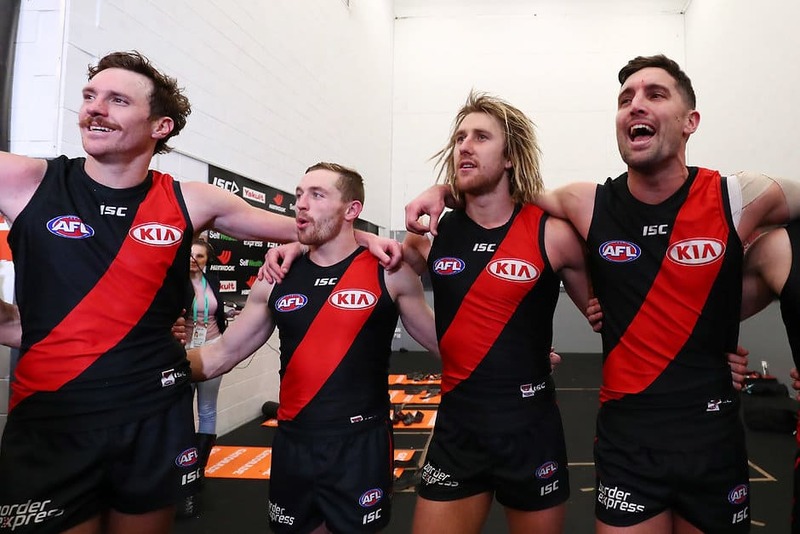 After skipper Dyson Heppell (189cm), the members of Essendon's midfield core are all 180cm or shorter – Zach Merrett, Darcy Parish, David Zaharakis and Devon Smith (176cm). Parting with Brendon Goddard (193cm) won't help either even if the veteran had been a less frequent centre-bounce attendee in recent seasons. Jake Stringer's first season at Tullamarine suggests the 192cm former Bulldog is a forward who can occasionally pinch-hit in the midfield and no more. And Andrew McGrath is a class act destined to eventually play on the ball, but at 178cm will only add to the Dons' undersized group. Which makes David Myers and Kyle Langford, both 191cm, potentially important players for Essendon in 2019. Myers was ranked joint first at the Bombers in 2018 for average clearances (4.9 a game, equal with Heppell) but injury troubles have meant he has played 20 games in a season just once in his career, in 2013. Langford also took some significant strides this year, playing 16 games, including the last 14 straight. If the former No.17 draft pick continues his development in 2019 and Myers stays fit, the Bombers might finally have assembled the midfield that can carry them to their first finals win since 2004.